Does Miss Fabulass now have a mortgage on the Flight Stakes after her outstanding win at Randwick on Saturday or could one of those behind her be the dark horse? 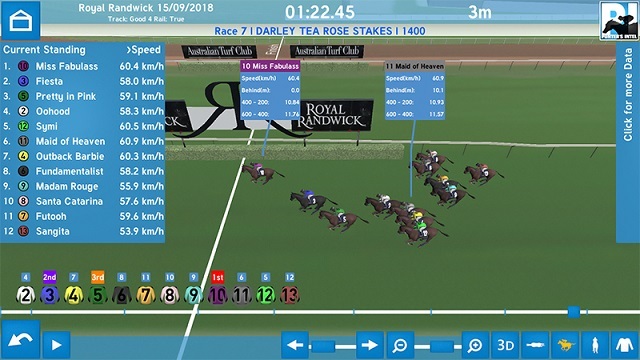 If so, the Punters Intel data is suggesting that dark horse could be Maid Of Heaven after her outstanding performance to run fifth in the Tea Rose Stakes (1400m). The Mark Newnham-trained filly was coming off a setback following a Canterbury win and she turned some 18m off the lead before producing the third fastest last 600m of the race in 33.73. Her last 200m was the second fastest, behind the winner, in 11.23 and she did have to negotiate a bit of traffic. An extra 200m of the Group 1 Flight Stakes looks right up her alley. Take nothing from Miss Fabulass, though, she clocked the best last 200m of the race in 11.09 and overall her last 600m (33.69) was the second fastest behind Pretty In Pink who ran 33.65. What can we say about Winx? The champ did it again, as we’ve come to take for granted, with impressive sectionals as she cruised home in a slick last 600m of 33.14 and, not surprisingly, the quickest last 200m of 11.08. Third placed Egg Tart is ticking over nicely this spring and her last 200m of 11.37 was the second best of the George Main Stakes. Three of 12 starters in The Everest next month clashed in the Group 2 The Shorts (1100m) and it was third placed Brave Smash who fared the best of that trio from a times perspective. He ran the fastest 600m-400m of 10.74 and a fast last 600m of 32.86 which was bettered only by fourth placed After All That (32.71) who ran the best last 600m of the day and earned a spot in The Kosciuszko on the back of the effort. There were excuses for Invincible Star who gave away her advantage by missing the start so her last 600m of 33.02 was dulled a bit by making an early effort. Her final 200m of 11.39 compares well with Brave Smash (11.34) who had an easier run. English was found to be in season, she ran 10.80 from the 600m-400m which was second fastest but obviously had nothing left at the finish. Warranty produced an eye-catching first-up effort in the final event, a Benchmark 88 over 1200m, running the fastest last 600m of the race in 33.41. Stablemate Eawase wasn’t disgraced despite finishing in the second half of the field from a sectionals perspective. The filly, a Listed winner last time in, ran the third fastest last 600m of 33.69 in finishing ninth. To the stayers and while Avilius again produced dazzling splits in his third win from as many starts in Australia (33.42 last 600m), the take home run from the Kingston Town Stakes (2000m) came from Big Duke. Last year’s Metropolitan runner-up showed he is on target to give Avilius a run for his money over the 2400m clocking 33.75 for his last 600m. The pair were the only horses to break 11 seconds between the 400m and 200m, Big Duke in 10.95 and Avilius in 10.89.